« Captain Hammer: Be Like Me! 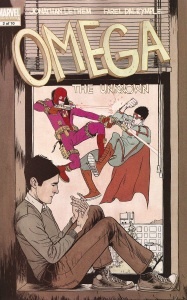 I went into the local comic book shop in Norwood, Massachusetts and said “teenaged superheroes.” After shoving copies of Runaways and a few other interesting series in my hands, one of the customers there suggested Omega: the Unknown by Jonathan Lethem, with art by Farel Dalrymple. I’m coming in at the second issue (2 of 10), so I feel a little bit like I’ve missed some Very Important Stuff (involving robots, trauma, and a hospital bed), but I caught the gist of it about halfway through. This poor geeky kid Alex, with the burns on his hands and the trauma in his face is having his whole life tossed upside down. Robots fight in the street outside his new home, and there’s this weird dressed-in-cape “blue guy” who keeps hovering nearby (and getting the snot kicked out of him, I might add). Meanwhile, the local superhero legend The Mink is so full of his own celebrity, it’s impossible not to detest him a little. As soon as he starts pounding on mute guy, of course, we really hate him. Our mute hero (who may or may not be Omega– it’s unknown!) reminds me of a borderline autistic adult. In addition to the muteness, he seems overall not to connect with other people, and he behaves in those strange ways that I recognize in folks in the spectrum. And yet, he does not seem to be a robot– after all, there are robots in this episode, and he’s not like them. He’s drawn intelligently– there’s no doubt he can put up a fight, but he is helpless in the realm of interacting with people. I like my comics to teach me something about being human, and this hero does that by the nature of his outsidedness. In summary: robots. Autistic superheroes. Jerks we can’t stand. A very confused and traumatized teen. I realize the series is over (ha! I don’t have to wait!) and will be collected and published this October. I think I’ll go along for that ride. This entry was posted by Stephanie	on Friday, July 18th, 2008 at 8:45 am and is filed under issues, Marvel. You can follow any responses to this entry through the RSS 2.0 feed. You can skip to the end and leave a response. Pinging is currently not allowed. This is one I will be picking up. We already have these (including the tenth and last issue that just came out), and now Marty can’t wait to read them! They’ll go in your pile soon, Susie. Apparently Jonathan Lethum is a beloved science fiction writer who picked this title up. It had a short run that looked very different back in the 70s, I think. I just finished all of the issues, and I definitely have a lot of thoughts about all of it. I guess I’m going to make some notes somewhere offline, and save them for the Book Club discussion of this next month. Hey Stephanie, maybe we can conference you in for the Book Club?